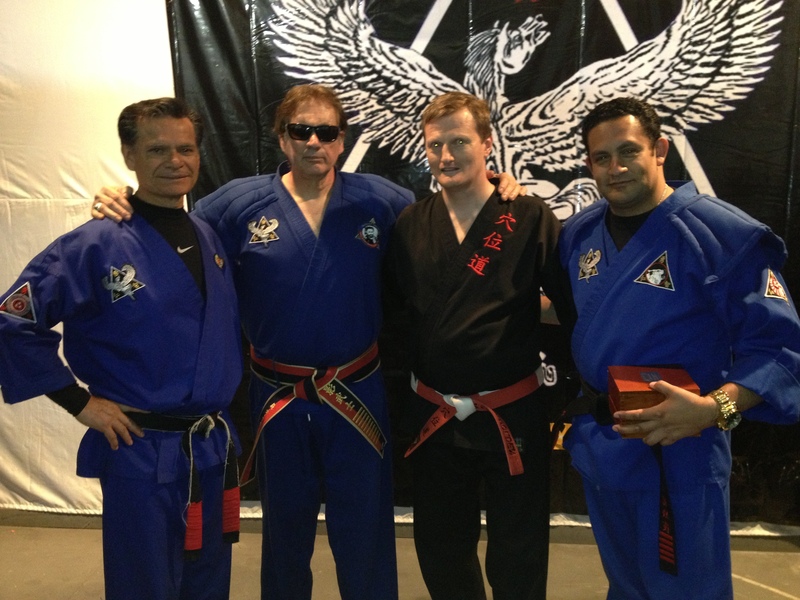 Sunday 22. of April 2013 attended the President of WPMAF GM Nils Volden a seminar in Dux ryu in Mexico city. The seminar was about guns and knifes in the style of Dux ryu. The instructor at the seminar were the eminent Hanshi Frank Dux. Dux delivered a great seminar with a deep philosophical analysis of how to get maximum force in your technique and how to protect yourself . Hanshi Dux also explained how to recived attacks and how to counter attack. How to disarm both knifes and guns; and how to fight with knife. Everything with a depth, knowlege and insight that only a true grandmaster might have. He did not teach the technique; he thought how to make it! Several hundreds of exstatic martial artists attended this Dux ryu seminar. The WPMAF president states that this was one of the best seminars he has attended if not THE BEST one. According to the persons present this was a NORMAL seminar with Hanshi Dux. When normal have this level, we have to recommend ALL seminars given by Hanshi Dux – A GREAT TEACHER. The seminar were arranged by the Dux ruy Mexican bransh with its fantastic Director Fransisco Dias Garcia. A personality out of the normal. Friendly, helpful, hard working and a great person. Another great person on this seminar were Hernan Carrasco Flores. He is one of the direct desendans from Ed Parkers American Kenpo. He were the first person to bring Kenpo to Mexico. For our Persident it were a experience and an honor to get to know Carrsco. April 22, 2013 in Uncategorized.